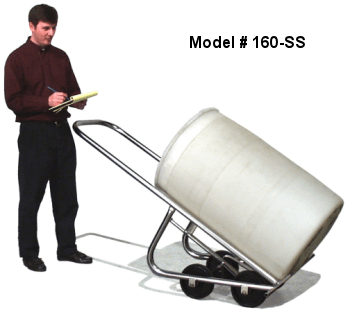 Stainless Steel Drum Truck for moving a drum across rough terrain. It has with inflated tires mounted outside the frame. 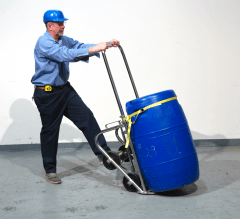 to move and dispense a heavy drum with ease. Morse stainless steel drum hand trucks. 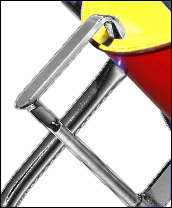 Tighten optional strap around your rimless plastic barrel to secure it. Made of finished type 304 stainless steel, these drum trucks are corrosion resistant, and have no paint to wear or chip off. 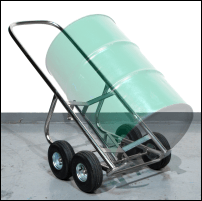 The innovative design of this stainless steel barrel hand truck provides extra safety, ease of use, and versatility. 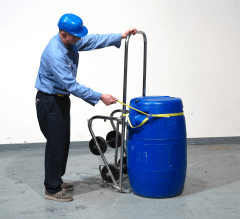 Load and unload a heavy drum with ease and move drums in narrow aisles while keeping your hands protected inside the U-shaped Knuckle Saving Handle. Even pour a drum into a 5-gallon pail. 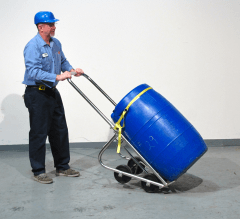 The four wheels fully support the drum's weight, so you don't have to bear or balance the load. Maneuvering is easy... it turns on a dime. Stands alone on 4 wheels holding full weight of drum. Does NOT require you to support or balance the drum. and a regular hand truck? 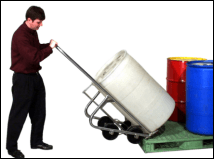 With a drum truck, you engage the upper drum rim and and pull the handle to tilt the drum toward you. Then the two "toes" of the drum truck fit under the curvature of your drum to support it from underneath. No need to tip the drum away from you to slide a base plate underneath. You can then move a drum onto and off pallets, and position a drum for dispensing. When you're done, the drum truck stands upright by itself for space saving storage. This stainless steel rum truck features has four large 8" (20.3 cm) MORTUF polyolefin roller bearing wheels carry the load. This Stainless Steel Drum Truck eases moving a drum across rough terrain such as grating or gravel surfaces. The wider inflated tires mounted outside the frame provide a more stable base. 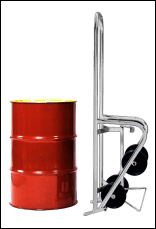 Stainless Steel Drum Trucks to move and dispense heavy drum or barrel with ease. Morse stainless steel barrel handling trucks.